“the ability to quickly adapt to the demands of the sport”. Your sights must be steady and aligned before, during and after the shot. Your arc of movement should be at its minimum before, during and after the shot. Your focus on the foresight should be sharp and continuous before, during and after the shot. Your trigger pressure must be positive and continuous before, during and after the shot. Your mental focus on the executing the above must be continuous before, during and after the shot. The abovementioned skills follow a certain sequence or steps which when followed correctly will result in a perfect ‘follow through’ or ‘10’. This arrangement of steps in a sequence is called as the Technique for Shooting a ‘10’. To those who do not have a coach or access to a correct training programme, it may take years and years before you figure out the technique for shooting a ‘10’. So the first step in QUICKLY ADAPTING is to get hold of someone who can demonstrate this technique for shooting a 10. And not only merely demonstrate it but he should be able to teach you the technique in a simple easy to understand and friendly manner. The next step is a training plan where you can learn to master the above mentioned skills as QUICKLY as possible. 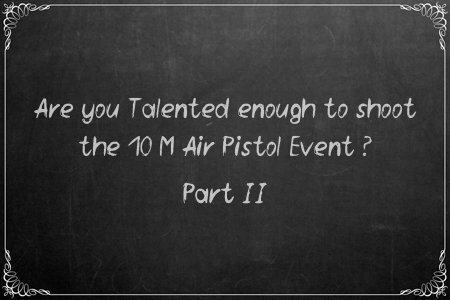 In the next part we will discuss the problems faced by shooters in adapting.